It’s here! It’s finally HERE! 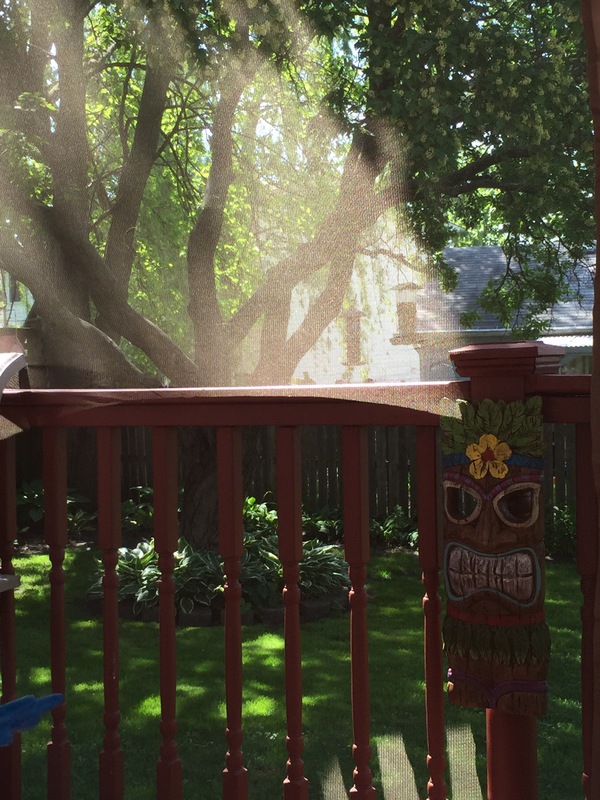 Spring is done with its tantrums of warm and cold and I can finally enjoy time on the Tiki Deck! Sundays are my fav for enjoying coffee al fresco with the sights and sounds of our little oasis. This morning the squirrels are chasing robins on the fence. Songbirds are chirping and zipping in and out to the feeders. The sun has already warmed up the day. (Take that old man winter!!!) I can hear a game of cricket being cheered in a park a few blocks away. GAHHHH! Hooray! Not the cricket game; the hummingbirds! The first sighting of this season on my feeder just now. I promise little birdies, I will have some Hibiscus in pots for you soon! Speaking of things that buzz by…. our tree is in bloom. 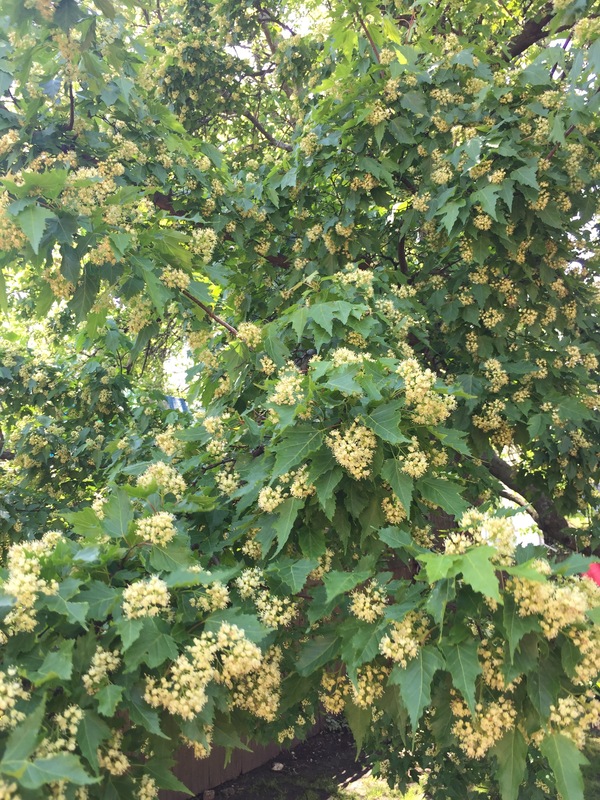 We don’t know what kind of tree it is, but every year it is full of small flowers and swarming with every kind of buzzy bee imaginable! I know they are important (SAVE THE BEES!!) but TBH, I don’t like them up close. I sit with the cabana screen zipped snug… kept safe from those buzzy guys. I mean really! The big bumble bees are HUGE and so clumsy– like they are drunk on nector! The only thing allowed through the screen is the breeze. The tree perfumes the air… almost lilac… but not. Someone is cutting their lawn; sweet green smell floats to my yard too and mixes with the tree and a hint of my mug of coffee. Then something odd. The breeze suddenly has a marine quality… salty almost. I breathe deeply and look in the direction it came from, trying to determine how that can be?! Salty air in the suburbs? 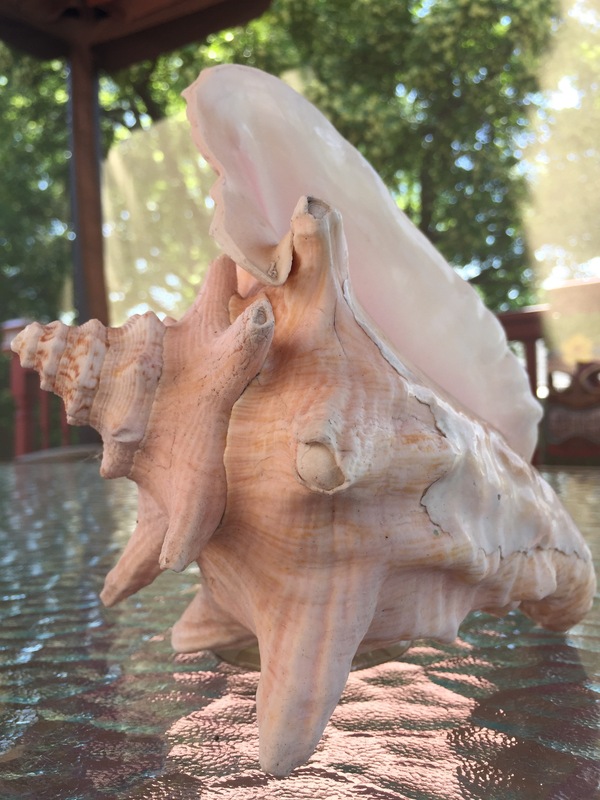 The conch shell on my table offers up the sound of the sea…. but the smell? No, that’s on the wind. Salty air. You know it if you’ve been to the coast. That distinctive smell. Eyes closed… another deep breath. I’m transported! I am on a trip to Mexico, or the Caribbean or the Florida shores. Maybe it’s just my imagination… but something on the wind takes me back… toes wiggling in the sand and foamy tide fizzing on the shore. My coffee mug has gone empty. I’ll go for a refill. You can wait here and enjoy a little visit to the shore.